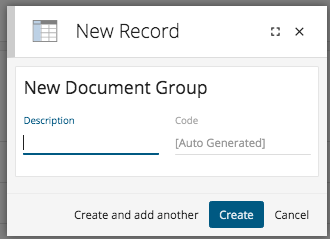 This article outlines how to configure your document template groups within the CRM. Document Templates can be organised into groups to make it easier to find the one you’re looking for. For example all quote templates may be grouped together within the Sales Document Group. To configure your Document Groups you will require Prospect 365 Administrator rights, if you require these then please speak to your key CRM user or our Customer Services Team. To edit your Document Groups, click on the settings icon in the bottom left-hand corner. Once within the Settings Centre, navigate to the Email & Documents section & scroll down until you reach the Document template group configure option. By selecting the 'Click to Configure' link the Configure Document Group window will open. Within this window all of your current Document Groups will be listed. To add a new one click on the + icon in the top right-hand corner. Simply give the new Document Template Group a name & click Create. Your new Document Template Group will then be available for selection when creating new templates & for your CRM users.